Should we look past Marcus Smart’s numbers if they’re good? 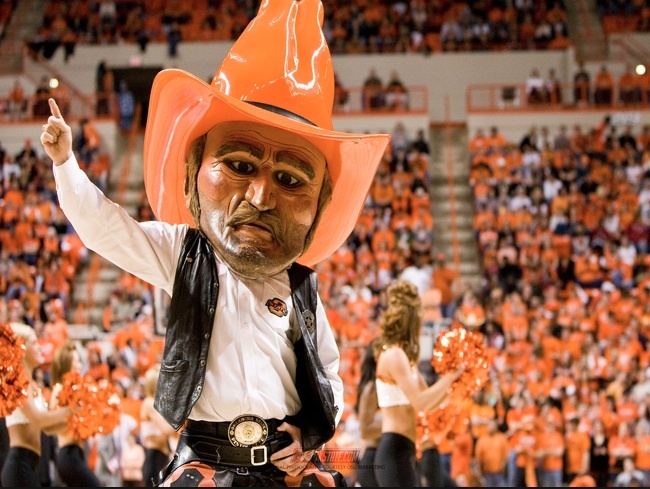 Pistol Pete gets a bonus year to cheer on Smart. The 6-foot-4 Smart, who won the Wayman Tisdale Award as the country’s top freshman, said he’s coming back also to improve on his 1.3-to-1 assists-to-turnover ratio and his 40 percent shooting from the field, including just 29 percent from 3-point range. To those who say this seems like a fairly lengthy to-do list for the presumptive national POY, the stock response is that we need to look past stuff like that when it comes to Smart. Maybe I’m the last optimist in the room on the subject of Smart’s performance. I see no reason to look past his numbers, because this season they may be outstanding. Yes, Smart had a horrible year shooting threes as a freshman, but 78 percent accuracy at the line tells me better perimeter days may be just around the corner. Sure, Marcus Smart shot 52 percent on his threes as a sophomore and proved to be one of the most effective scorers the college game has seen since Chris Paul. But with Smart numbers only tell part of the story. Advanced metrics like the number of shots that go into the basket are a farce, and Smart’s really not that good. The NBA should stay far away from this kid. Sometimes you have to look past the numbers. 1. NBA esteem. Perfectly understandable. Look at him. He plays point guard, he’s huge (6-4, 220), young (he won’t turn 20 until March), skilled, and his motor is factory-installed. Smart is also beloved of coaches, who to a man offer up the kind of hosannas that they never bestow upon equally talented but much more problematic locker room presences. Even with poor three-point shooting, Smart’s freshman season is a close KenPom match with years recorded by the estimable likes of James Harden, Nick Calathes, Archie Goodwin, Scottie Reynolds, and Javaris Crittenton. Three of those guys are in the NBA, and a fourth would be if he weren’t a knucklehead. Plus Smart’s a better defender than any of those players were in college. The kid’s a lock. 2. Future-tense college accolades, like first-team All-American selection for 2013-14. Less understandable than No. 1, but explicable. It’s certainly not a stretch to think that Smart will finish his sophomore season as one of the top five players in the country. 3. Future-tense college accolades, like being the only unanimous first-team All-American selection for 2013-14. Not particularly understandable, but of course part of that has to do with wholly extraneous questions like making a somewhat coherent or even remotely explicable appraisal of Doug McDermott. 4. Past-tense college accolades, like being a consensus second-team All-American in 2012-13. Not particularly understandable. Smart got one shot at a freshman season, and on defense he was sensational. On offense his threes didn’t fall, his success rate inside the arc when he wasn’t fouled was average, and his rate stats as a point guard wouldn’t get a second look if not for No. 1 above. The “Yes, but he plays defense!” response to Nos. 3 and 4 is fair enough in terms of appraising Smart’s value relative to other point guards, for he may indeed be the best defensive point guard in the country. But if you really want to bring actual defensive impact on opposing teams into a Smart-vs-all-comers discussion, be careful that you don’t end up retroactively giving the 2013 Big 12 Player of the Year award to Jeff Withey. More fundamentally, the problem with laboring to construct these detailed rationalizations of an NBA-track player’s season is that we never do it for the other 99 percent of Division I. Look at Markel Brown. Same exact opponents, virtually identical minutes, strikingly similar workloads in terms of shot attempts, and on offense Brown was superior to Smart in every category except assists and drawing fouls, usually far superior. Smart is the better defender, but once you reach this point in the discussion the larger point is already made — funny how no one has ever felt compelled to mount a “you have to look past the numbers” rationalization of Markel Brown’s defense. Other college players had better seasons than Smart last year, and other players will probably be drafted before he is next summer. But it may well be the case that no other Division I player who saw action in 2013-13 and did not enter the 2013 draft will be selected before Smart is. (Right now the players above Smart on the mock boards for 2014 are all freshmen or international players.) Seen in this light, Smart’s unanimous selection was not only understandable, it was close to inevitable. None of which means Marcus Smart doesn’t have plenty of room to improve during his final college season. When he does, let’s pay him the compliment of accurate praise. This entry was posted in hoops, Marcus Smart schools of thought on November 6, 2013 by johngasaway.